Mix well the sauce. Set in fridge. Mix flour mixture in one bowl. Beat egg mixture in separate bowl. Toss steak with flour mixture. Pour egg mixture over steak in flour. Give a slight toss. Heat oil on skillet. Brown all sides. Slightly Butter Flavor Cooking Spray Crockpot. ADD IN SAUCE first. Lay fried steak on top. Leave it be. If stirring is needed, Stir Minimumly! Cook on LOW, or even warm, for 4 hours. I say DO NOT stir often, due to browned batter falling off. It’s a mess if you do. BUT, a delicious mess!!! Preheat oven 350. Fry in oil til browned. Move to baking dish. Pour sauce over. Bake for 15minutes. Slightly turn. Bake another 10-15 minutes. Or until desired doneness. If you add a lil baking powder and baking soda into the egg mixture for extra crunch, it will turnout too… Fry. Bake at 350, if needed, to desired steak doneness. Heat sauce in pan, top sauce mixture RIGHT BEFORE serving. Your option on cooking method. All work. Also, I pour egg batter over, because I think it’s easier than alternate dipping (Flour, egg, then BACK into flour), which I lose most batter on fingers. Especially, working with small pieces. Whole steaks alternate works. Boil potatoes in pan with enough water to barely cover potatoes WITH chicken broth cubes. LEAVE THE SKINS ON! Why… Why do yous hate the skins so much? Remove potatoes when tender. RESERVE JUICE. Mash Potatoes, add rest of ingredients PLUS 3/4c water/broth potatoes were cooked in. Mash and stir some more. 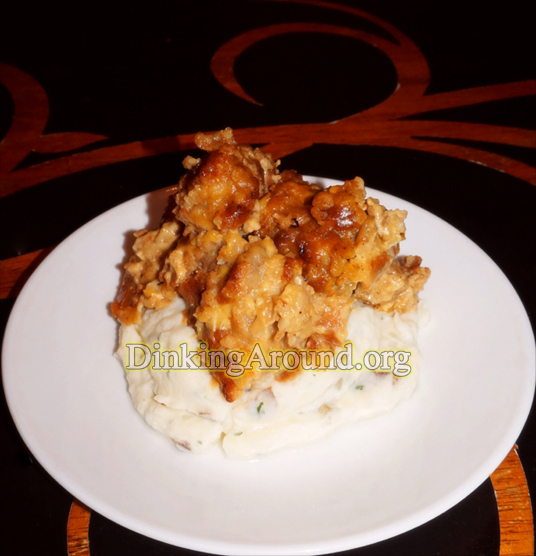 This entry was posted in Main Dish O' Food, Recipes and tagged country, cow, crock pot, crockpot, fried, mashed, potatoes, steak, taters, ttt mashed taters, ttts mashed potatoes. Bookmark the permalink.